(SEAN YODER/The Gazette) The Team Ream Foundation recently donated a transport van to Mount Nittany Medical Center. 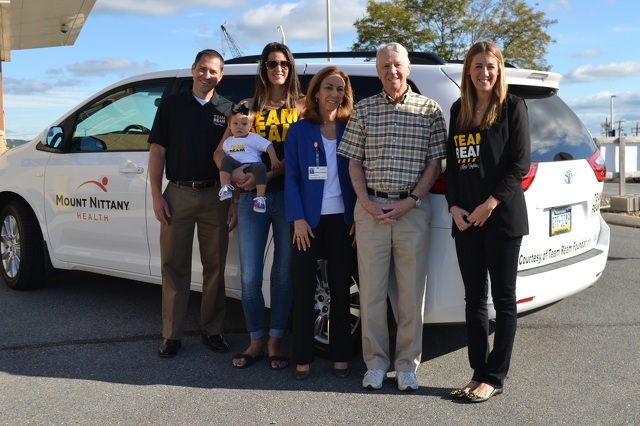 From left are Mike Martin, Team Ream board member; Kelsey Ream Napolitan, board member; their daughter Wyatt Napolitan; Kathleen Rhine, Mount Nittany Health CEO; Richard Bell, Mount Nittany patient, and Samantha Ream, executive director of Team Ream. STATE COLLEGE — The Team Ream Foundation is known for helping individuals and their families in the fight against cancer, giving more than $70,000 over the last three years. The foundation’s donation on Sept. 28 was something a little different for them, said Samantha Ream, executive director of the Ream Foundation. Patients at the Lance and Ellen Shaner Cancer Pavilion at Mount Nittany Medical Center will be able to take advantage of a new Toyota Sienna van, which will be available to transport them to and from their frequently-needed treatments and appointments. Team Ream will be pushing for an even larger presence in the community next year. “Right now one of our big projects is we're starting a huge fundraiser for 2018, trying to get more people in the community involved in Team Ream so that our fund with Mount Nittany can continue to grow,” Ream said. She said they just settled on their date for the annual Team Ream Day with Penn State men’s basketball. This year it will be on Feb. 3 vs. Iowa. Ream said the organization is always looking for more volunteers to help raise funds and spread awareness in the community. Team Ream Foundation began when Brandon Ream, late husband of Samantha Ream, battled against bone cancer. The State College native and son of Camp Woodward founder Gary Ream passed away in 2013. He was a Penn State football player and went on to become vice president of operations at Camp Woodward. The foundation continues on, giving mostly monetary support to those fighting cancer. Samantha Ream said they’ve given more than $70,000 over the last three years to the Mount Nittany Foundation and helped more than 30 families. She said the monetary support usually helps pay for medical expenses such as treatments.